As I was walking around my neighbourhood this weekend my eyes were drawn to a a man selling small pets off the back of a cart by the side of the road. He had rabbits, various brightly coloured fish and baby turtles which seemed popular with parents buying them for their kids. I didn’t think much of it at the time and quickly took a couple of shots before moving on. Today someone left a comment against the goldfish photo on Flickr that they must have been dyed to give them such bright colours. I’d heard of street sellers in China dying dogs more desirable colours to fetch higher prices but didn’t know the same could be done to fish. As you can imagine the chemicals used are highly toxic and are so unhealthy for the animals that it often reduces their life expectancy to less than a week (even after feeding them painkillers). In the case of fish the dye is injected into the skin after being dipped in a chemical bath, a very cruel process, which also leads to a quick death. Unfortunately this is another case of animal cruelty for the sake of profit. Goldfish may be small little things but there’s still no excuse for this. 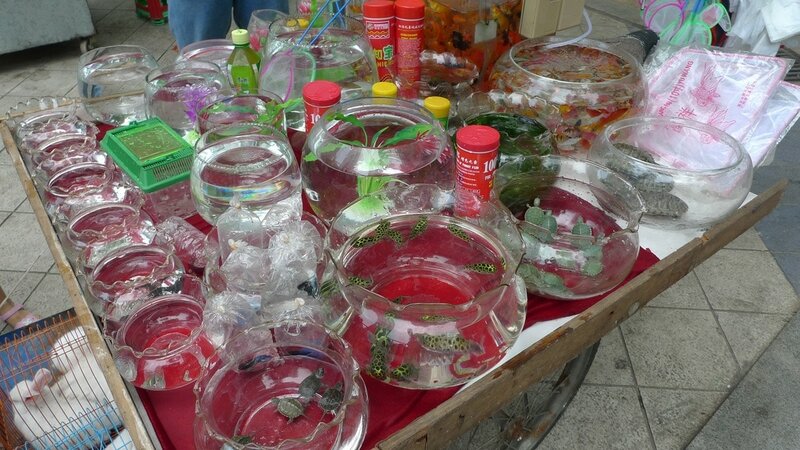 I don’t know if there are any laws against this kind of thing in China but hopefully people will see sense not to buy pets from disreputable vendors. This is not animal cruelty. It’s a science project done in science classes all over the US. Get over it. It is animal cruelty and any schools allowing this are violating the law. Injecting animals with anything is illegal unless done so by a vet and is to help the animal, not to make an extra dollar. For you to say it isn’t is ridiculous because half of those fish will die before even receiving the dye because of the painkillers and chemical bath. Fish are sensitive to any chemicals, and will die quickly. “Feeder goldfish” live just as long as any other type of goldfish with lifespans ranging from 8 to 20 years or more. Goldfish are NOT short lived just because they are classes as a “feeder” animal. 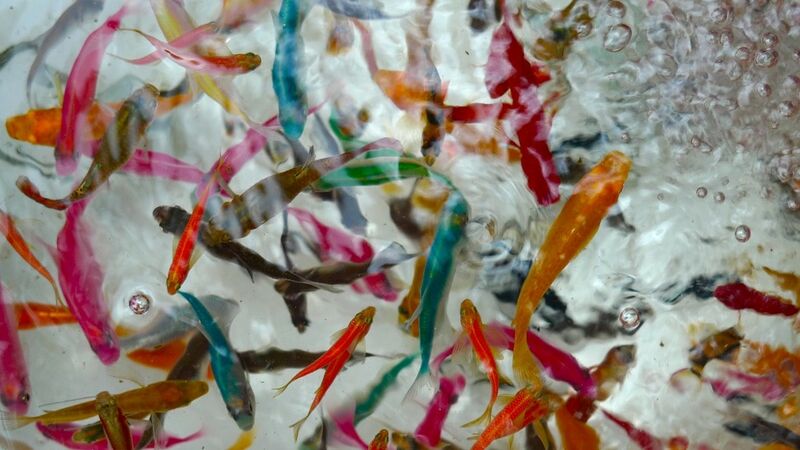 This simply means they are raised in such large numbers to satisfy the demand for people who need them as bait or food for other fish or reptiles. As for the dying, the injection of the dye IS animal cruelty and IS illegal in various UK and North American areas. Pet stores in some states of the US can be fined for having them in their tanks. Schools in most US states have also been banned, though some US universities are using jellyfish bioluminescent genes in fish experiments. Putting fish in colored water is NOT the same as injecting dye into them. The colorant added to the water is usually food grade water-based dye (food coloring) and the effect can be likened to the keratin of carrots or of algae helping to improve natural colors. Food grade water-based dyes do not shorten the lifespan of the animal, and I can gladly provide multiple university studies that show this from both the US and the UK. The same (using food grade water-based dye) has also been used to dye Roses, Carnations and Canary birds. Obviously the flowers won’t live long as they are cut prior to being placed in the colored water, but the canaries have lived many years on dyed water with no ill effects, going on to produce offspring normally. Again, I can gladly provide citations for any of the above comments from university sources in North America and the UK. Thank you, I am going to test food coloring in water for science, but I didn’t want to put the fish through any pain. This really helped, and your right gold fish feeders do have a long life span my goldfish I got started out about two inches long, and now are about 8 inches. Its pretty incredible! I just bought an apricot gold fish for my pond. The color seems unnatural and its behavior its very stressed and sickly, is it possible he is a dyed fish to anyone’s knowledge? If so my pet store has a whole stock of them and I do not agree with this form of sales push at All, and will not suport this animal cruelty behavior! Perhaps they don’t even know, I can’t find it anywhere on the internet, maybe perhaps he’s just sick. With an illness I am not aware of after all my years of fish raising. 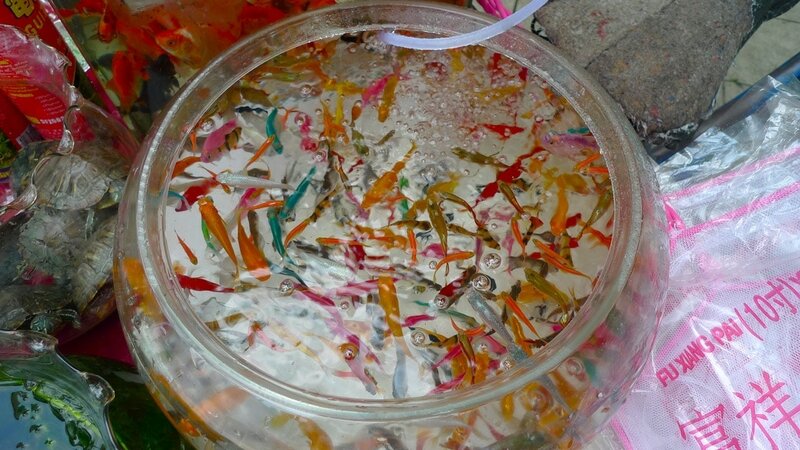 I recently saw Wal-Mart in Paris Kentucky is selling the injected colored fish. I know this because the Man tending to them told me. When I asked if it hurt them he said No they don’t feel any pain. NOT!